I’ve been thinking about the implications of what I said yesterday about the Clovis “points” being the first example of a stone artifact that bears unequivocal evidence of its maker’s intention to haft it to a shaft. If you missed it, here it is, for you, Dear Reader, direct from its one-day-long run on Palaeoanthropologica at Facebook. I’ve remarked on this before, in my critique of Belfer-Cohen and Hovers’ “In the Eye of the Beholder: Mousterian and Natufian Burials in the Levant,” Current Anthropology 33:463-471, 1992. Is not this tantamount to saying that there’s a direct relationship between the presence/absence of ‘grave goods,’ their ‘sophistication,’ and the degree of cultural ability? Since this is something that Belfer-Cohen and Hovers would argue against, I find it interesting that they would introduce such a notion at this point in their argument. A pig mandible, if it were in fact shown to be an object placed with a purposely buried individual (and could be demonstrated to have had some symbolic meaning to that hominid, which would be difficult to argue from the archaeological evidence), should not be looked down upon as ‘mundane’ (or that it represented an incipient kind of symbolic behavior) simply because it does not conform to the investigator’s (culturally bound) ideas of what constitutes ‘sophisticated’ funerary offerings. [(!) I’m thinking as I put this passage into today’s blurt.] I would add that the enigmatic structures mentioned in their paper, such as “talking tubes” or “eternal flames” associated with Natufian burials, do not carry such inherent meanings—these are constructions of their excavators and are not self-evident. I’m struck by the ease with which Belfer-Cohen, Hovers and others accept such inferences and speculation as a reasonable construal of the archaeological remains. 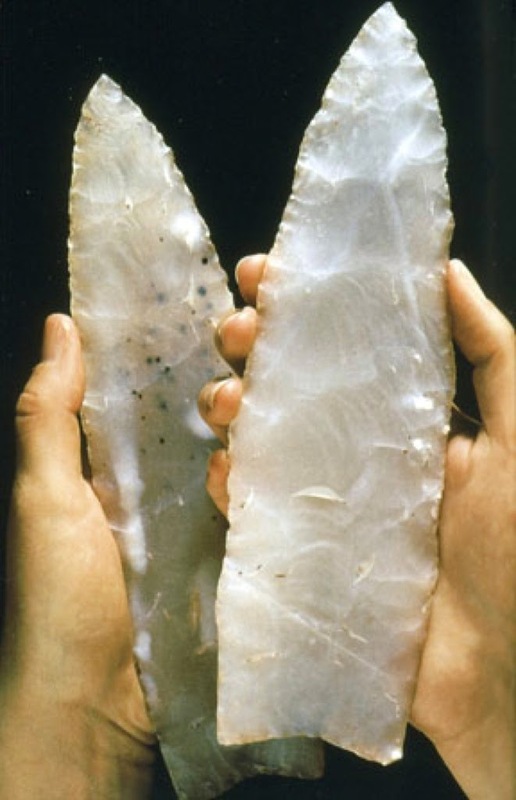 And so, when I went off yesterday about hafting and Clovis points, it emanated from the same place in my viscera whence came my lecture to Belfer-Cohen and Hovers. 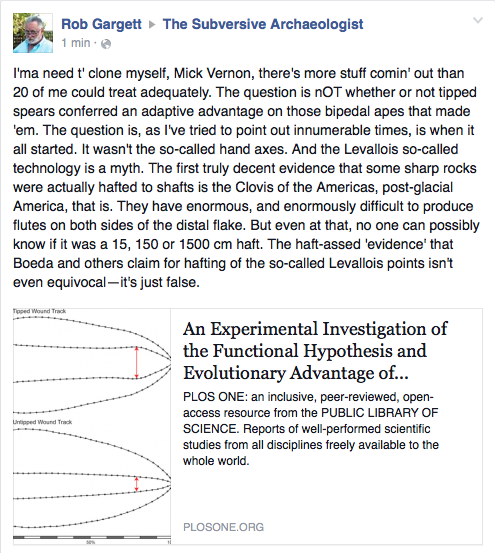 To the rank and file of paleoanthropology, I say just this. 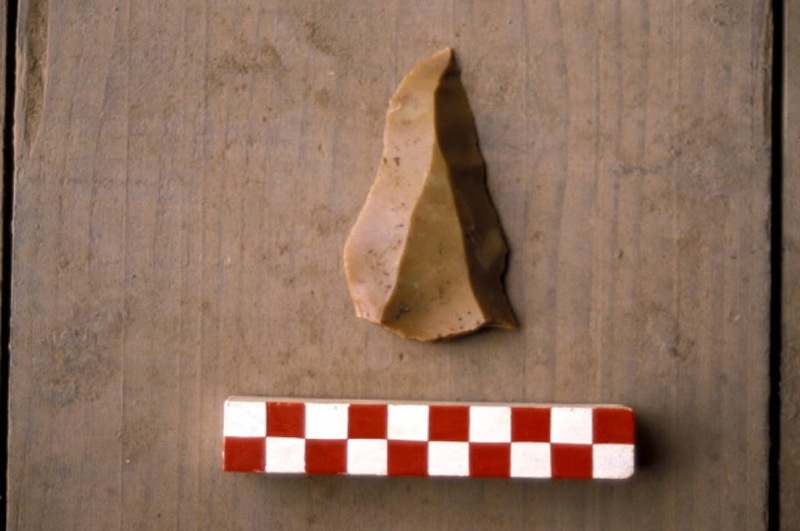 is not the equivalent of the things pictured below—Clovis points from the East Wenatchee Clovis Site (also called the Richey-Roberts Clovis Site or the Richey Clovis Cache). But, then I’d sit back, remembering that you’re publishing in PLOS ONE and I’m just a blogger, who, everyone knows, is sitting in my virtual pajamas in my in-reality-dead mother’s basement, tapping away in my totally uniformed and (thankfully for the discipline) ineffectual way for anyone to read and believe, but who, if so, is demonstrating that they’re ill-equipped to tell the difference between my pseudo-science and your ‘real’ science—the best reason ever for dismissing blogging out of hand. And here I’ll stay. 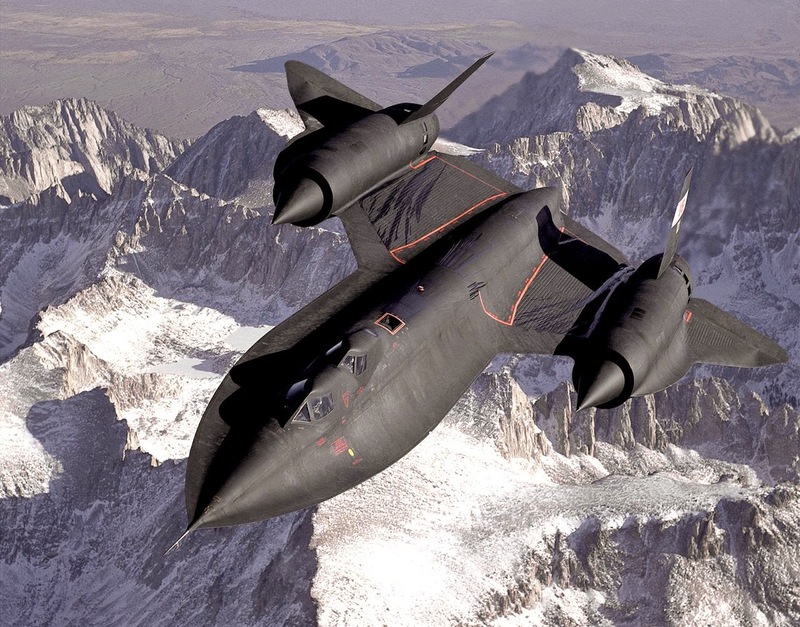 Oh, and by the way, here’s a picture of that SR-71. Just one specification will help you comprehend how far above my lath and 4×4 creation this mechanical beast was. Maximum speed: Mach 3.3 (3,540+ km/h at 24,000 m—give or take its operating ceiling). For those of you who, like me, are a little unable to fasten on the real implications of such numbers, think of it this way—the fastest rifle bullet emerges from the firearm’s muzzle at around Mach 3. My lath and 4×4 airplane sat on the top of the porch for weeks before I resigned myself to the fact that it’d never fly—no matter how much I willed it to. Neanderthal Childhood? WTF? Spikins et al. Should Get A Grip! A number of colleagues have commented that the original article used unnecessarily violent language with respect to Penny Spikins and Paul Pettitt. While I feel that the original text merely evinced poetic license, I have nonetheless moved the piece to a separate page that must be accessed only through this page. Thank you for visiting, and for your cooperation.